This is the author's latest book and the seventh that I've read for review, although I have enjoyed reading privately many others of his. The quality of his writing and research has not diminished over the years, in fact it seems to get better. I found this latest one just as exciting and dramatic as ever. After an unhappy meeting in Germany, Jago decides to put his job on hold and follow Marconio to Italy and after a chance meeting with a girl named Consolata, who gives him good advice he decides to observe Marcantonio and his Mafia family from under deep cover and debate how he can invoke justice against the offender. 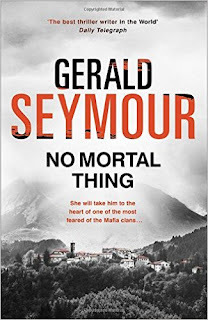 In the interest of reading a good story one has to suspend one's disbelief that a man in a very good and highly paid banking job in Germany would on a whim abandon it and go Italy to hurt in some way a Mafia gangster. The story reminded me of his book A DENIABLE DEATH in that both stories employ the protagonist in a surveillance capacity under deep cover for quite long periods of time and the author's skill is deployed in lengthy descriptions of small movements of both the watchers and the targets. This may seem a bit long-winded but with the author's deep understanding of such tactics it becomes very tense. The book moves swiftly on until the explosive ending. 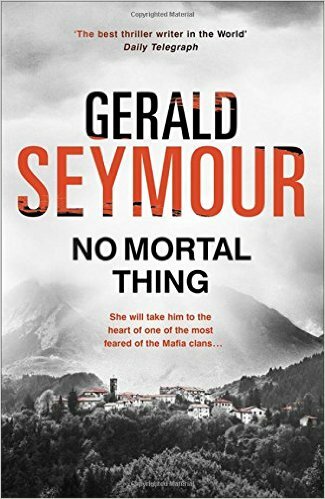 Gerald Seymour has been a full-time writer since 1978. NO MORTAL THING is his thirty-second novel. I hope he writes many more and that I get the chance to read them all as I have never known him to write a dull one. I enjoyed this book tremendously and was thoroughly enthralled until the final page. This story was absolutely gripping and I urge you to read this novel. A passionate review indeed! Though the story does simply not fascinate me. Thanks.